Perennials are the organic heart of the garden. They return year after year and represent the most sustainable type of gardening. We offer varieties that are difficult to find, that are extraordinary in performance. Evergreen perennials make up a large component in our climate where snow is limited and landscapes are green. They maintain a continuity through the darkest days of the year. Many of our perennials are drought adapted when established and combine well with drought adapted shrubs. We are constantly expanding our offering of native perennials- a category sorely lacking in our gardens. We believe this to be a cross inheriting some of the coloration of A. auranticus as well as A. cana. 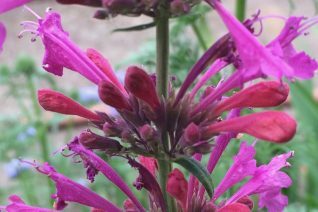 To 28″ tall this clump forming, everblooming perennial brings bright red buds that open to purple flowers. The colorful combination lasts all summer into autumn. New flowers are born on the same spikes so do not remove. Moderate consistent water through the first summer to establish. Double dig soil to incorporate oxygen into the soil and aid in irrigation to the roots. Established plants get by with a little less. Loved by hummers and pretty decent cutfower as well. Full all day sun for best performance, will not be quite as floriferous in part shade. Sweetly scented foliage is an extra benefit. To 18″ wide and slowly increasing. Excellent on berms as well as slopes. Mulch in fall. Small rosette of winter foliage is protected by the previous years defunct stems. Prune these away after all threat of a hard freeze has passed. One of our all-time best introductions ‘Electric Punch’ is a floral powerhouse of a hummingbird mint with exceptional adaptation to our cold and wet winters. 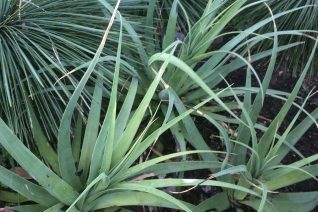 Rising to 34″ tall in bloom, a clump can become enormous in rich, WELL DRAINED soil with light, consistent summer water. Also, accepts no water but with interruptions in bloom. Incorporate plenty of oxygen into the soil and slopes are ideal. Do not remove flower spikes during the season- new orange aging to pink flowers appear from the same inflorescence. Best to wait until spring to cut back the previous seasons defunct stems. Moderate deer resistance. This is our selection of an improved form of the species Agastache auranticus. It has deeper orange flowers on taller stems and exhibits excellent winter/cold/wet hardiness. To 30″ tall, the vivid blooms erupt from June to October. Tightly clump forming perennial whose tall wand-like stems require more horizontal room as well. Hummingbird Mint excels in very well-drained soils with consistent, light summer water. Full sun- you can fudge in light shade and still get results. Remove the previous seasons spent stems in March. 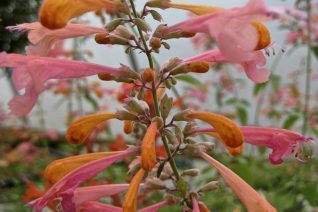 One of our larger growing introductions this is a flowering machine with large individual flowers that open pale orange and senesce to pale pink. Overall this is a pastel flower palette. 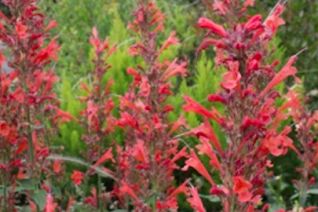 To 36″ tall and as wide in full sun and well drained soil with light, consistent summer water. Agastaches are excellent as container subjects- they will accept the most cramped roots and still perform. Wait until March to remove the previous years spent stems. Give this guy room. Hummingbird nirvana. Good winter hardiness. 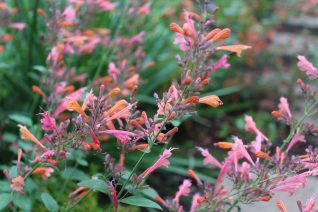 Our selection of a compact and free flowering cold hardy Hummingbird mint with intense dark orange flowers. Blooms June to October and they rise on spikes to 18″ tall. Does not flop- great for smaller spaces. Regular summer water in well drained, enriched soil. Excellent on slopes which improves winter drainage which increases cold hardiness. Full sun to very light shade. Irresistible to pollinators. Blooms appear from the same spikes all season- do not remove. Wait to cut it back until spring. Then remove dead top growth to make way for the new growth that is pushing from below. Cute flowering hyssop that makes a clump of strongly vertical stems clad at the tips with soft mauve/purple flowers. A boon to pollinators as well as hummingbirds. Blooms June to October continuously from the same spikes. To 18″ tall and barely half as wide. 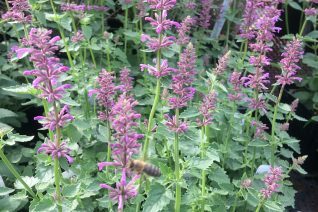 Agastaches like light soil. Double dig the soil well to incorporate oxygen and apply a handful of all organic fertilizer at planting. This will establish the plant much faster. Excellent performance on slopes where it achieves the drainage that it likes. Middle of the border or massed in a meadow- this easy to grow perennial performs for a long time. Do not cut back until after Valentine’s Day. Consistent water for the first summer then light water in subsequent years. Excellent performance in mixed container plantings. Moderate deer resistance. Foliage is sweetly pungent. 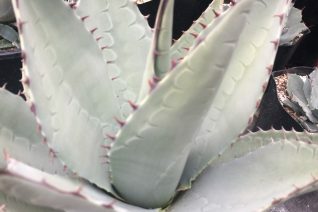 Tender <sigh> but perhaps the most spectacular variegated Agave. It makes a great container plant for LARGE containers. To 5′ x 5′, it grows a little slower in containers. Make sure it’s sturdy and well built too because this puppy has been known to grow so vigorously as to shatter its own home. Use well drained cactus mix and add a handful of all organic fertilizer. Move to a freeze free environment such as an unheated garage if temperatures threaten to drop below 20ºF. Otherwise move it to a dry place for winter- under a south facing eave is ideal. Move it back out in the open when rain dwindles. Light summer water will speed growth. Leaves on this form are blue on the edges with a dramatic pure white stripe down the center. Wow. 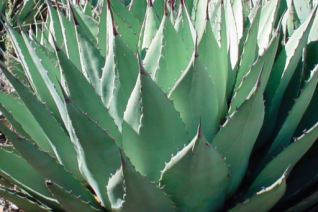 Far and away the easiest Agave to cultivate in our climate and the handsome contorted sage green leaves are free of a deadly spike at the tip. Don’t be fooled, though. The leaves are lined in fine serrations that can cause a cut if you rub your person against them. 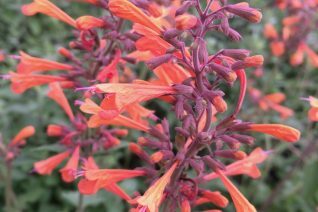 To 3′ tall and as wide for very well-drained soils in full sun to very light shade. Amend the soil with pumice to sharpen drainage if needed. Ideally adapted to slopes. Good dimensions as a large focal point in a rock garden or clustered into clumps in the gravel bed. Accepts the highest reflected heat. Light summer water speeds growth. Spikes! 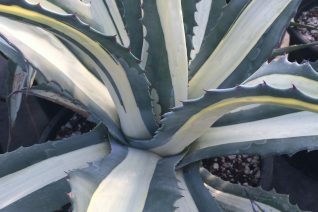 A very upright and pokey Agave with steel blue/gray foliage that forms large rosettes. To 3′ across eventually this cold hardy Agave demands excellent drainage but is worth the effort. VERY well drained soil- amend with liberal amounts of pumice and gravel. Excellent on a slope. Plant with the rosette tilted to shed winter water. Makes new pups happily and they will often come up quite a distance from the parent plant. To 3′ tall when up and established. Great in containers that you protect from winter wet. Move to a covered place in fall- a south facing eave is sufficient. Cold hardy below 0ºF- when established. Best to plant in March or April so that it has the longest possible season to develop a tap root going into its first winter. Light summer water to none. High deer resistance. From the very far north end of this variable species range in Northern Arizona near—‘Flagstaff’. High elevation form that is found above 7000′ in the wild. Very cold hardy moderately large Agave. Full sun and very well drained soil. You must amend the soil with pumice and gravel to avoid wet accumulating around the crown in winter. This is made all the more easy by placing on a slope. The rosettes should be tilted to shed winter wet. Very stiff and sharply tipped steel blue leaves form a rosette that is at first upright then spreads out a little. Remove leaves from deciduous plants that collect in the rosette in autumn- they blow in from god knows where and leaving them can encourage rot. Excellent in containers. Move containerized plants under an eave or overhang to keep it dry in winter. No water required after initial establishment. Beautiful form of this cold hardy species. High deer resistance.